Five ornamental/commemorative column designs from ancient Greek pottery decoration, traced from publications. 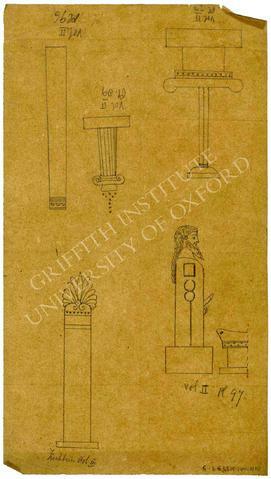 Upper left: column shaft with decoration on top; upper middle: Ionic column; upper right: Doric column on altar; lower left: column or pillar with palmette [detail from Tischbein, W., Collection of engravings from ancient vases of Greek workmanship discovered in sepulchres in the Kingdom of the Two Sicilies but chiefly in the neighbourhood of Naples during the course of the years MDCCLXXXIX and MDCCLXXXX, now in the possession of Sir W. Hamilton..., vol. III (1795), pl. 51]; lower right: herm and part of altar.